15% discount on Appstore and iTunes gift cards at Big W store this week. Find smartphones and tablets on pg 11. If you need a new smartphone but don't want to spend much on it, this is your place to find a decent product. Samsung Galaxy J2 pro is one of the choices for people like you. Pay only $189 for J2 Pro. This device can run many popular apps and it has a long life span. I think at least 2 years without a problem and 4 years if you continue. You can even make it longer if you don't want to upgrade to the new versions of mobile apps. Valentine's Day sale still goes on at Big W stores. Find great plush animals, half prices on snacks and candies. Lindt Lindor gift boxes, Mars gift boxes, Natural Confectionery Co. Lolly bag, Mars celebrations, and Ferrero Rocher as popular chocolate brands in this part of the Big W Catalogue. Baby care products like formulas, pouches, nappies, and more can be found on pg 16. Kids' bedroom products like cot and mattress which is only $149, are available on pg 17. 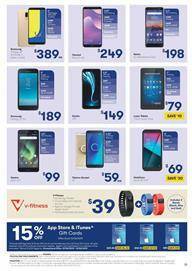 Don't miss out these deals from Big W and follow the Facebook page for future products. A Star Is Born DVD and Blu-Ray, new DVDs and fiction books are available on pg 12. Check out these new fun products and lower prices by Big W.